The magic of Windsor On Ice will be returning again to Alexandra Gardens this Christmas, and this year it’s open for an even longer spell! 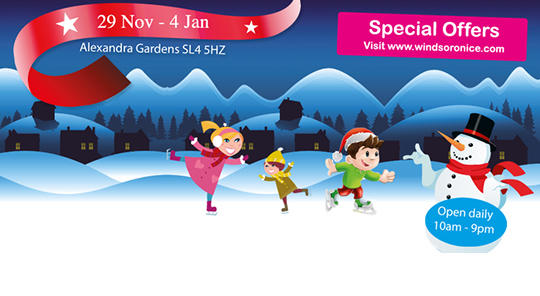 This popular Christmas attraction will be open EVERY DAY* from Saturday 29th November until Sunday 4th January, with many exciting rides suitable for all the family and an outdoor skating track for those willing to brave the cold. There’s special offers on ice skating tickets such as the ‘Early Bird 2 for 1’ offer and ‘Loyalty Cards’ for both singles and families, and many opportunities to meet Santa or take your own Christmas-themed photos. Festive food and drinks will be available, plus a covered seating area where you can view the ice rink, and a private function room to hire for birthday and Christmas parties. Marquee hire will be supplied by ABC Marquees and the ice rink – made of REAL ice ! – is supplied by Cities On Ice.